Scientists have recorded the longest non-stop migratory flight made by birds. Scientists have recorded the longest non-stop migratory flight made by birds. 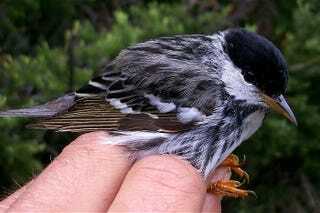 By equipping blackpoll warblers with a GPS, researchers learned the diminutive 12 gram bird can cross the Atlantic — an average distance of 1,580 miles (2,540 km) — over just two to three days. This migration is "on the brink of impossibility."